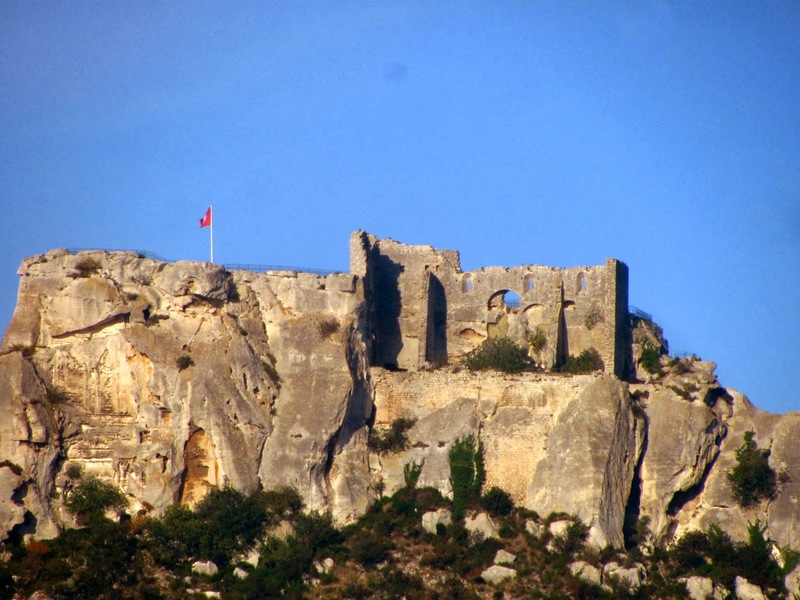 I didn't visit the ancient village and fortress/chateau of Le Baux-de-Provence when I was in Provence last October. I drove by it and actually parked less than a kilometer away to visit the Carrieres de Lumineres. But it was almost noon when the show in the old bauxite mine was over, and I could tell by the cars lining the road that the village would be packed with tourists. Le Baux is one of the 'most beautiful villages in France' and is a popular tourist attraction. Habitation on this rocky outcrop has been traced back to 6000 B.C. The Counts of Baux made this their stronghold from which they attempted to rule all of Provence. Interestingly, the Baux family traces its ancestry back to Balthazar, one of the three wise men who visited the Christ Child in Bethlehem. I visited Le Baux briefly some years ago with friends. We lingered over lunch in St. Remy-de-Provence, unfortunately arrived at Le Baux in mid-afternoon. It was hot, and the village was teeming with tourists. We stayed long enough to know it would be worthwhile to return...early in the morning on a cooler day! I will definitely make a visit the next time I travel to this part of Provence. Your pictures are awesome. I hope you realize how lucky you are to live in such a beautiful country. Going to France and being able to discover La Provence remains one of my biggest dreams. Please continue to tell us your story with all these pictures so we can travel with you.